Convenient parking is available in the French Market's parking lot located behind the Market. Enter from the riverside of Decatur & St. Peters Streets. Join the French Market in a traditional tree-lighting ceremony. Come early, dine and shop in the French Market for the holidays and stay for the lighting ceremony which starts at 12:00 p.m. For more information, please call (504) 522-2621 or visit www.frenchmarket.org. Free. From Papa Noël , Mr. Bingle and Celebration in the Oaks That’s only the beginning to Christmas with a New Orleans Flavor… Free nightly concerts at St. Louis Cathedral presented by local musicians; cruising the Mississippi on a paddlewheel steamer singing Christmas carols; watching the blazing lights of bonfires along the levees; carriage rides under New Orleans’ stately moss-draped oaks; running into Papa Noel and Mary Christmas as they roam the French Quarter; tours of antebellum homes; children’s crafts workshops and even teas; free cooking demonstrations by the city’s best chefs. City Park's annual festival of magical holiday light displays and musical performances to delight every age will be presented during the 2007 holiday season in the newly replanted Botanical Garden, Carousel Gardens Amusement Park, and Storyland fairytale playground. For more than twenty years, Celebration in the Oaks™ has been one of the city's most cherished events of the Christmas season. Join us as we build back our great city, hold on to our traditions, and bring joy and hope to those that have lost so much. Local choirs and New Orleans artists herald in the season with nightly concerts of Christmas carols and gospel favorites in one of the country's most historic churches. The ecumenical celebration includes gospel choirs, jazz vocalists and ensembles, and more. It will make Christmas New Orleans Style one of your treasured holiday memories. All concerts are free, begin at 6pm, and take place in Jackson Square at St. Louis Cathedral- a New Orleans icon as well as the oldest continuously operating Roman Catholic cathedral in the country. Witness the lighting of Louisiana's largest Menorah! On Sunday, December 9, Chabad-Lubavitch of Lousiana will host the annual Chanukah-at-Riverwalk. The event begins at 4 p.m. at Spanish Plaza, and features a children's program, music, Israeli food from Casablanca Restaurant, latkes and more. 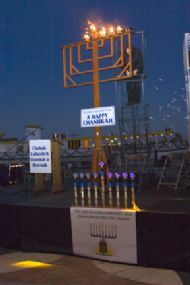 The ceremony to light the giant, 12-foot menorah begins at 5 p.m. The theme this year is Honoring Israel's Soldiers. As part of the year-long Israel@60 Celebration, Chanukah-at-Riverwalk will acknowledge the self-sacrifice of the brave young men and women who must confront not only conventional warfare, but terror tactics, and suicide bombers. They bring the energy and dedication of youth to the sacred task of protecting the Jewish people living in the land of Israel. The ceremony will include a special presentation and a "living menorah" composed of some of the past members of the IDF - the Israeli Defense Force - now living in New Orleans. The largest Jewish Event of the Year in New Orleans! Join in a truly moving 61-year-old tradition as Jackson Square brims with candlelit faces and song-lit spirits as high as the spires of the St. Louis Cathedral. Led by Patio Planters, the Social and Garden Club of the French Quarter. Candles and song sheets provided. Gates open at 6pm and caroling begins promptly at 7pm. For more information, call (504) 319-6226 or visit www.patioplanters.org. Free and open to the public. Savor the holiday spirit as Patio Planters, the Social and Garden Club of the Vieux Carré, present five beautiful French Quarter residences/patios dressed for the season. Features include interesting architectural styles and home furnishings as well as a variety of collections of Christmas decorations plus a visit from Papa Noël. The tour is a prelude to the highly anticipated, 61st annual Caroling in Jackson Square later in the evening. Tickets available after December 8 at Creole Delicacies (533 St. Ann Street) and New Orleans Gem & Lapidary (527 St. Philip St.). $15.00 Tickets will also be available by phone at: 504-524-9595 or 1-800-356-6252. All proceeds benefit Caroling in the Square.